I listened to Barbara Ehrenreich‘s new book, Bright-Sided during a recent road trip. Her analysis drew together many elements of American culture about which I have been vaguely uncomfortable – and provided a paradigm for understanding them. I remember the first time a K-Mart check-out clerk said, “Have a nice day!” It was the 1970s, and I could see the huge sticker on her cash register instructing her to say it. I vaguely remember that, in the first few months of the scripting of commercial conversation, your purchase would be free (probably charged to the clerk) if you were not given this blessing on departing from the store. At the time, it seemed bizarre. The phrase has become so ubiquitous that it’s hard to remember what it was like to say “goodbye.” We’ve learned to be more “positive” now. The first sections of Ehrenreich’s book deal with the omnipresence of “positive thinking” while the later parts of the book focus on the sources of this theme and – most disturbingly – its flimsy pseudo-scientific underpinnings. In the early 1980s, when I worked as an oncology social worker at the University of Chicago Hospitals, these “positive thinking improves your odds” treatments were just beginning. Doctors and social workers alike were aware that any slight edge that positive thinking might give – it had not yet been investigated – would be swamped by the other factors that determined how the disease progressed. In the years since then, the fervor of patients and physicians for anything that improves the prognosis has swept that early caution to the winds. Ehrenreich traces the positive thinking movement in the U.S. back to Mary Baker Eddy, founder of Christian Science, but shows how it became widespread in America through its adoption in business culture. A few books had an immense impact – Norman Vincent Peale‘s The Power of Positive Thinking, or Napoleon Hill‘s Think and Grow Rich. Their mammoth sales spawned the industry of providing “motivation” through tapes, posters, t-shirts, workshops and seminars and, of course, more books. The interplay of the positive thinking movement in businesses with the growth of the prosperity Gospel – which holds that “God wants you to have nice things” and urges people to “name it and claim it” – highlights the continuing aspect of religion and ritual in the positive thinking movement. According to Ehrenreich, both the mortgage providers and the home-buyers in the housing bubble were living in the same positive-thinking bubble. Ehrenreich is willing to be persuaded, or to find the element of truth, and seeks out the scientific psychologists who have been studying happiness and founding the Positive Psychology movement. This is perhaps the most discouraging section of the book to an academic. Findings from flawed studies with small effect sizes have become the foundation of all sorts of businesses even when the original or later studies demonstrate that the findings were a fluke, and positive thinking has no effect. She even documents the moment when the founder of Positive Psychology, Martin Seligman, announces that he is abandoning that effort in favor of “Positive Social Science” after discovering that the circumstances of one’s life – such as employment and poverty – really do play a substantial role in one’s happiness. The Positive Thinking movements conflate a wide variety of situations – physical health, personal relationships, wealth and finances, success on the job – and imply that all of them are affected by one’s positive thoughts. The unspoken assumption is that one’s conscious desires will bring about greater happiness. These Prosperity Gospels are devoid of any philosophy or understanding of what it means to be human. In fact, they reduce human life to a series of needs and wants, urging people to seek fulfillment of them through positive thinking. 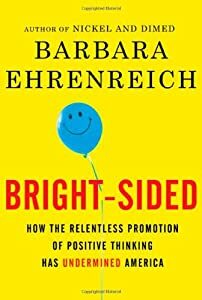 Ehrenreich’s primary critique – certainly on target – focuses on the way Positive Thinking prevents people from seeing the reality of their situation, and keeps them from effective action. Even that critique, however, misses the full impact. Happiness research – a field critiqued by Ehrenreich – often shows that people in relatively simple societies with relatively moderate incomes have higher levels of happiness than richer people in more complex societies. In the USA, more people rated their level of happiness as “high” or “very high” in 1957 than in any year since then. In the 1990s and again in the mid-2000’s, Americans experienced very high levels of material prosperity – but it did not produce equally high levels of happiness. Ehrenreich’s title, Bright-Sided, mirrors the common phrase blind-sided – when something disrupts your world without warning. Her critique of the Positive Thinking ideology leaves open an important question: what is important? What does it mean to be human? She invites us to return to ancient questions about the purpose of human life, and the way it should be lived. Although her book cannot provide the answer, by exposing the Positive Thinking ideology to the light of day, she sets her readers free to pursue these questions. The first sections of the book deal with the omnipresence of “positive thinking” while the later parts of the book focus on the sources of this theme and – most disturbingly -its flimsy pseudo-scientific underpinnings. Having fallen a victim to insomnia again this morning, I spent some profitable time reading your blogs, Sister Edith. I like your sense of humor and your common sense. Thank you. I’m sorry to hear about insomnia, but glad that you found the blog.